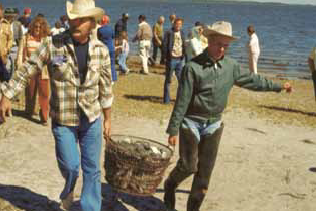 Many people are unfamiliar with the seineyard tradition that once dominated the Panhandle of Florida, especially the Capital City to the Sea Trails study area. A seineyard was based in shallow waters with little obstacles and a beach to haul and prepare the catch. There were 16 seineyards located between the St. Marks Lighthouse and Turkey Point in Franklin County, including the West Goose Creek Seineyard. Many seineyards were located near the St. Marks Wildlife Refuge and were a great place for economic activity as well as social gatherings. People from southern Georgia would travel by wagon to assist in the process and barter other goods for the salted fish. The typical fish caught at seineyards was mullet and because mullet deteriorate so rapidly, they were salted or eaten right after coming out of the water. The seineyard industry began to decline in the 1980s with the last of the shelters being destroyed by Hurricane Kate in November of 1985. Though seineyards are no longer present, this once traditional fall gathering was a popular pastime for many along the coast and will remain an important piece of the region’s history.